Milwaukee's solar initiative is looking to expand on its first group-buy solar initiative last year, which helped lead to more than 30 installations across the city. That's three times as many solar installations than in 2012, and the city credits the growth to a solar group-purchase program that began in the Riverwest neighborhood. The public-private partnership helps residents take advantage of lower-cost solar installations through volume purchasing. The group buy was responsible for 16 installations in Riverwest, along with another in Bay View. "The solar group-buy model has proved successful because it provides education on the technology, financing solutions and utilizes the strength of volume purchasing to bring the cost down even more," said Amy Heart, manager of Milwaukee Shines, a project of the city's Office of Environmental Sustainability. The Solar Bay View initiative kicked off Wednesday, with more informational sessions scheduled in the weeks ahead. Enrollment will take place between now and May. Solar Bay View's sponsors include Riverwest Cooperative Alliance, Milwaukee Shines and the Midwest Renewable Energy Association. The program is open to Milwaukee-area residents outside Bay View, but its main focus will be within the neighborhood. "The concept of a group-purchasing program fits right in with the principles of cooperatives everywhere. People come together to meet an otherwise unmet need," said Peter Murphy, who works with the Riverwest Cooperative Alliance, an organization comprised of local cooperatives. "In this case, the Bay View neighborhood has a unique opportunity to show the rest of Milwaukee how people power can accomplish meaningful and practical goals, like energy independence." 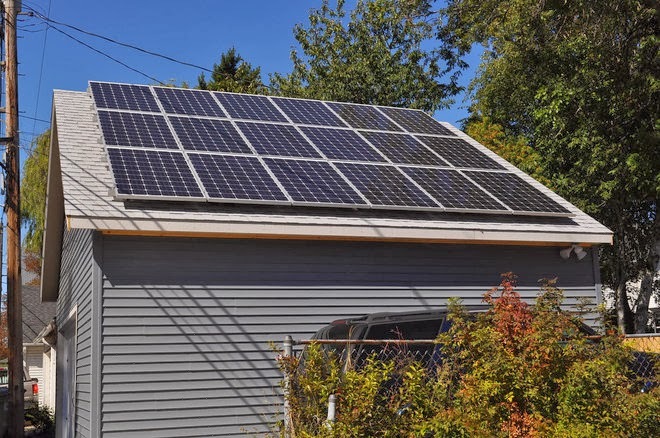 Paula Papanek of Bay View put 12 solar panels on her roof a few years back and was able to take advantage of the Riverwest group purchase last year to install 18 more panels on her garage. She's volunteered to advise neighborhood residents on what questions to ask and provide feedback on her own experience. "It's important that homeowners have the opportunity to talk to somebody who's done it as opposed to hearing from a sales rep," she said. Adam Gusse, vice president of H&H Solar Energy Services in Madison, said the Riverwest group purchase program followed a similar one in Madison. Group-buy participants saved about 20% compared with a solar installation of a comparable size, Gusse said. Some of the savings came about because so many projects were physically close together, from buying greater quantities of panels, and from reduced sales and marketing costs, he said. "It was really great to have a coalition of many different organizations coming together to make for what is a great success for solar in Milwaukee," Gusse said.